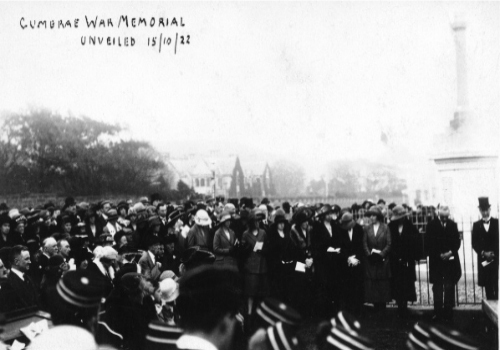 Millport's war memorial to the dead of World War I was unveiled on Sunday 15th October 1922 in Guildford Street. 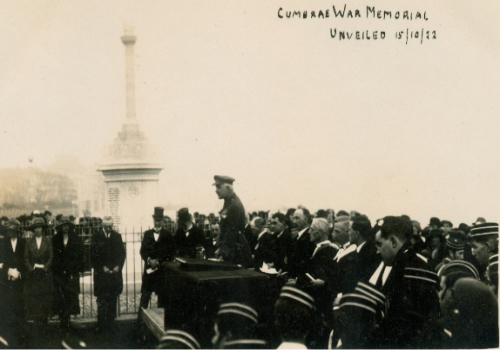 Earlier in the day flags in the town were flown at half-mast and on the steamer. After church services the townspeople made their way to the unveiling. 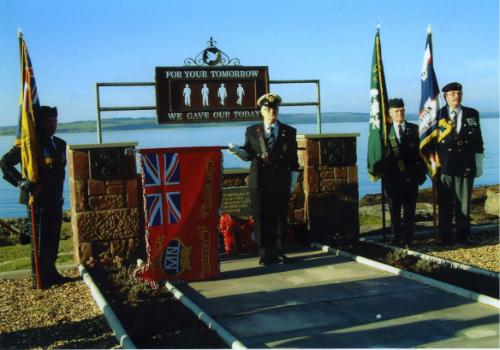 Also present were the Largs Territorials and ex-servicemen who came over by motor boat. A memorial service was held in the West United Free Church and the Territorials and Boys Brigade marshalled at the Drill Hall before parading to the church. After the service they proceeded to the memorial which was unveiled by Col Colin McLeod Robertson who had led the local brigade to war in 1914. 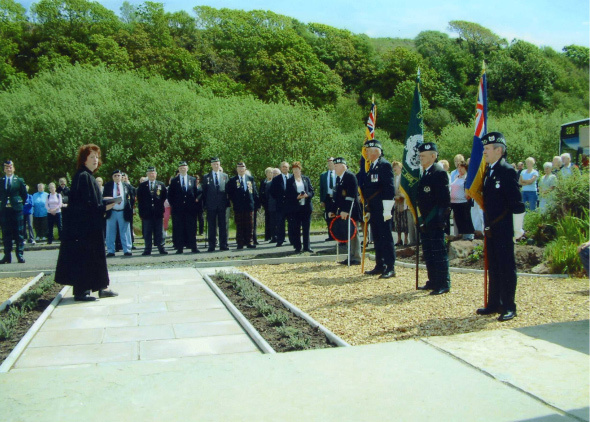 The names of the dead were then read out by Captain J C M Murray and the Boys Brigade Band played The Flowers of the Forest. 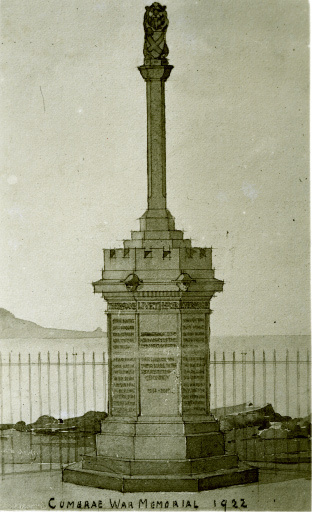 The memorial was then given over to the Town Council to guard and protect it. The memorial was built using public subscription money under the guidance of the Memorial Committee. It was made of silver-grey granite with scrolls on its base, a pinnacle and topped with a lion holding the Millport Burgh Crest. It was made by Glasgow monumental mason Mr R Gray. 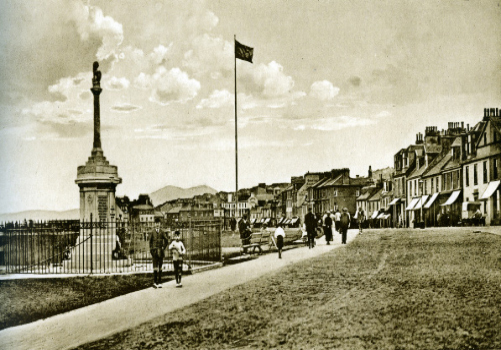 In 1919 Millport Burgh was selected, along with many other Scottish burghs, to be given captured German ordnance as a form of memorial. 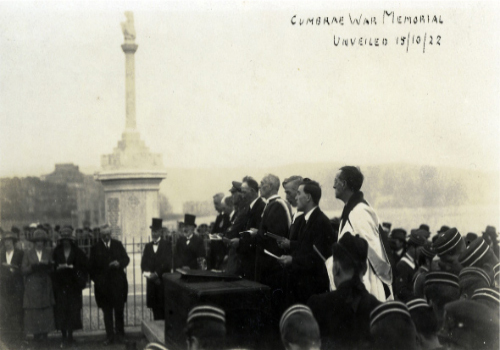 This act by central government proved to be very unpopular as the public felt they were an unwelcome reminder of the war. 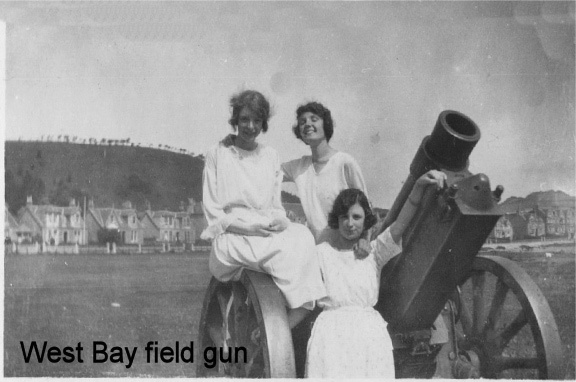 Millport was to receive two howitzers (small field guns). 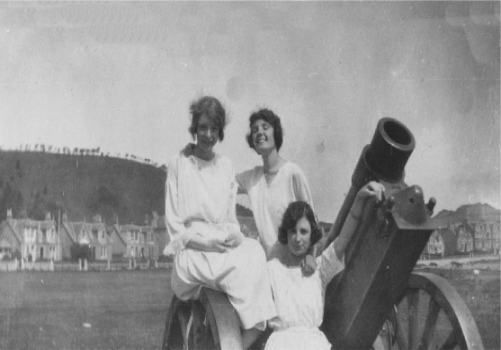 Largs had been given a machine gun that was in such poor condition they sent it back! 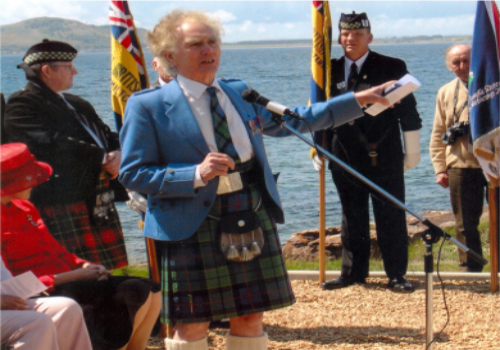 Millport Council was split over the guns with Bailie Robertson and Provost Cockburn keen but Councillors Sinclair and Gardner opposed saying people didn't want them and it cost too much to transport them. So keen was the Provost that he said he would pay for the transport cost himself. In January 1920 the guns had been delivered from Rothesay and left at the pier. No-one seemed interested in them now and the council couldn't be bothered deciding where they should be sited. Eventually the burgh moved them in March to inside the gate of West Bay Park. As related these ordnance weren't popular in Scotland and the burghs started getting rid of them. Some were sold for scrap - as told in one of the Para Handy tales. Some "disappeared" it is said into the Clyde. 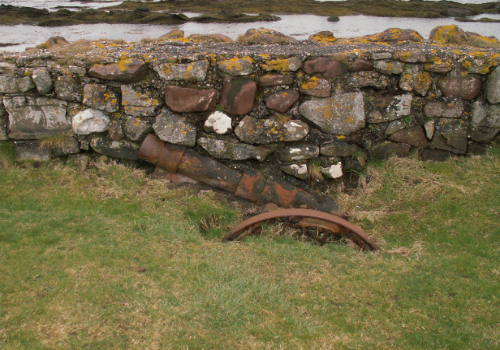 Millport buried hers under the sea wall of the West Bay Park. 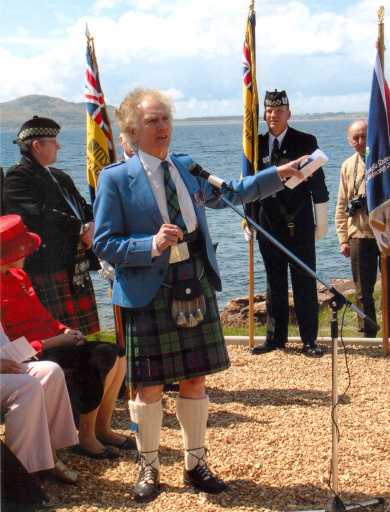 Today one has been exposed by the weather and is becoming an additional attraction for visitors to Cumbrae. 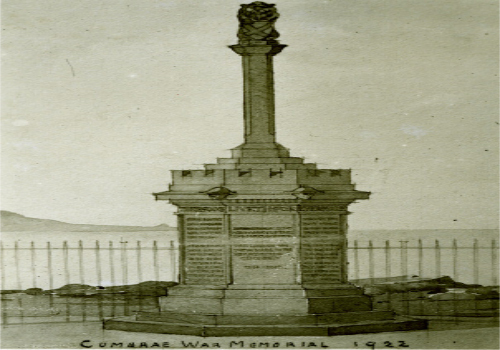 In 2005 a new War Memorial was built on the west side of Cumbrae. It consists of a path, memorial garden, monument and metal artwork. The memorial was the idea of Ian Forsyth and was dedicated by Rev Marjory Mackay of the Parish Church. The land it is on was donated by Willie and Matthew McIntyre. It was built by David Stevenson and the metalwork was by Ian McBay.